Many organizations still operate within an old workplace paradigm where a human being's value is determined by status in the hierarchy and whether an employee is a good “production unit" in the eyes of management. Employers think that unless outside force is applied to keep workers in line, production and quality will suffer. We are, however, in the midst of a paradigm shift in consciousness about the workplace. In the new workplace paradigm, people at all levels of the organization are encouraged to find meaning, purpose, and a sense of wholeness in their work. Everyone benefits when workers are enthusiastic about what they do and have a good sense of themselves. Cooperation replaces competition as each person fills a niche in the organization that only he or she can fill. Not only is morale improved, efficiency and cost effectiveness can also be positively impacted. Passionate employees create an energizing force that attracts new opportunities and new customers. Free flowing creativity promotes innovation and spirals organizations toward excellence. And when groups aspire to excellence, they can be a powerful presence in the marketplace and community. Whether organizations are businesses, government entities, educational institutions, or non-profit agencies, how effectively they can make the transformation to the new paradigm determines their vitality, growth and resiliency as organizations. As leaders, we are often called on to lead or manage change efforts for our organizations. We may be used to leading organizations through the process of developmental change or transitional change, where the outcomes are generally predetermined and timing is more or less in our control. Requires us to learn new skills and expand our knowledge base, while operating within the same context. When we lead this type of effort in our organization, we encourage those we lead to focus on their personal development. Example: Sending employees to a class to learn a new computer program, so they can streamline the current work they do, such as processing invoices and getting out billings. Requires moving from an old state, through a transition period to a new state. Leaders overseeing this type of change effort must have the skills to manage developmental change. They also need to have a global perspective to see the big picture, be strategic thinkers, know how to effectively plan and have project management skills. Example: Implementing an enterprise-wide resource planning system (EPR) that retires legacy systems and combines into one system business functions such as accounting, human resources, customer databases and supplier relationship management. 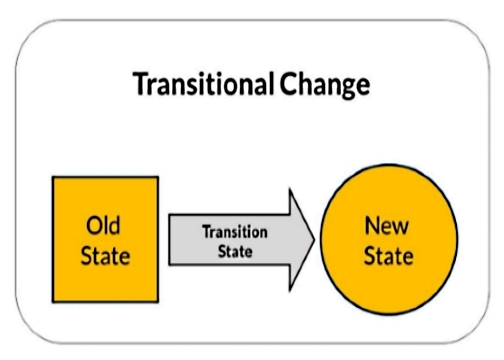 While transformation requires all of the leadership skills involved in developmental and transitional change, leading organizations through a transformational process is very different. It is designed to evolve the organization’s culture, not just change the mechanics of how people do their jobs. The outcomes and timelines are more uncertain, since transformation intimately involves people in exploration. Together they create something new for the organization that requires a shift in the cultural mindset. Example: Instilling a Servant Leader mindset in your organization. To lead a transformational process, as facilitators, we are called to listen to the “inner voice” of the organization, which Robert Quinn describes in his book, Deep Change as “the integration of the messages in the hearts and minds of the many.” To listen at this level takes self reflection and a willingness to live from our center and lead from our center. It is from this place that we are truly ready to facilitate organizational transformation. All the participants involved in a transformational process step off the precipice of certainty together to jointly create what has not yet been envisioned by any one person. It can be an exhilarating time of co-creation. It also can be a scary time, especially for individuals who have difficulty moving out of their comfort zone, who aren’t committed to lifelong learning or who are used to having leaders “tell” them what to do. For organizational leaders facilitating the transformational process, it can be a particularly stressful time. We have to hold the space for everyone else, who is going through their own challenges with transformation, while we are in the midst of our own transformational process as a participant. We have to get comfortable with this discomfort to be effective facilitators. Something else important to understand about transformation is that rather than being about how to change, it is actually an uncovering process that aligns each of us more closely with the best of who we naturally are, personally and organizationally. It is an inspiring dive within, that asks us to pool our creativity and support one another to evolve personally and collectively. It opens us to explore how our organization’s unique collective journey can lead to greater contributions to ourselves and the community, so we can succeed beyond our wildest expectations! How the Heroic Journey Transformation Process provides an indelible memory tool to help place real life situations we encounter into the larger context of transformation, which brings a more evolved meaning to our experiences. How the Stages of the Heroic Journey, provide signposts that help everyone involved in your organization gain insight about what actions need to be taken personally and collectively for the organization’s evolution. How your organization’s Collective Journey and everyone’s individual journeys inform one another in a continual learning loop that helps evolve the cultural understanding of what is possible. How Servant Leadership builds a service-based mindset within your organization, which places people and the greater good first.